It is estimated that one in four women suffers from serious depression at some point in her life. This practical book provides a unique, compassionate perspective on an all-to-common problem from a woman who has been there. 224 pages, from NavPress. 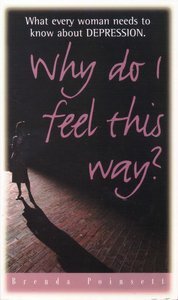 About "Why Do I Feel This Way?" What's Wrong With Me? It is estimated that one in four women suffers from a serious depression at some point in her life and that one in three women between the ages of 18 and 24 is significantly depressed. There is help available. Why Do I Feel This Way? shows you how to access thet help you need to overcome depression. You'll learn: 1) Why more women than men get depressed 2) Specific ways to help prevent future depression 3) What medications and treatment options are available 4) How to draw upon spiritual resources for healing 5) Ways to counsel others who are depressed If you're been looking for something more than long volumes of technical information about depression, Why Do I Feel This Way? offers a unique, compassionate perspective on this all-too-common problem from a woman who has been there. It will help you understand what you're feeling and take positive steps to overcome depression.--This text refers to the Paperback edition. This book examines depression-its causes, symptoms, and cures-and offers hope to the millions of women it affects.